If one were to read the message by the Fund’s Executive Director Mark Dybul in an annex to the report of the Office of the Inspector General on its audit in the Democratic Republic of Congo, one would come away with the impression that with some minor exceptions, the Global Fund’s grants to the DRC are performing very well. This contrasts with the report itself which identified significant weaknesses in all areas of program delivery and financial management. With regard to quality of health services the report found inadequate programmatic oversight at all levels and limited mechanisms to prioritize activities which enhance the quality of health services and which left unchecked, may reduce the impact of the program. The report goes on to state that the Global Fund’s strategic approach has not always proved effective at the operational level in DRC. In its concept notes, the country has estimated that only 16% of funds needed to achieve strategic targets are available for HIV, 44% for tuberculosis, and 57% for malaria. The Global Fund and its partners continue to scale-up interventions on the three diseases in spite of the funding gap. However, this is not being met by commensurate improvements in the quality of services for people suffering from the three diseases. The report found that the Ministry of Public Health continues to have limited capacity to ensure program oversight at all levels. The report goes on to state the OIG found weak supervision and training activities by the national programs, particularly in overseeing quality of services. To rectify this, the Global Fund Secretariat has agreed to work with the principal recipients to develop an integrated supervision plan for HIV, TB and malaria services supported by the Fund. The report highlights further deficiencies in the management of health products. In the absence of effective programmatic supervision, defined accountability for drugs consumption, and formal transportation arrangements from the central level to the health facilities, stock-outs are pervasive along the supply chain and expiries of drugs are not controlled. Stock-outs and expiries of drugs were noted at all levels of the supply chain by the OIG. The OIG observed that one of the country’s largest regional warehouses, in Kinshasa, was out of stock of all formulations of artemisinin-based combination treatment on the day of the OIG’s visit, and it noted that three out of 19 regional warehouses were out of stock of all artemisinin-based combination treatment (ACT) medicines at the time of the audit. The OIG also found that certain types of drugs were often unavailable and that different formulations of ACTs were out of stock for one to four months on average. HIV tests and certain types of antiretroviral treatment drugs were unavailable for up to two months on average. Anti-tuberculosis drugs were also affected: In one hospital, stock-outs of up to a month were detected. These stock-outs were pervasive and affected both reference hospitals, and health centers. Auditors could not trace 31.1% of products shipments originally dispatched from regional warehouses, between their expeditions from health zones and the expected reception at the health facilities. This lack of documentary evidence to prove that drugs reach health facilities affected certain drugs more than others. For example, 47% of adult formulation of ACTs and 40% of “Determine” HIV tests could not be traced. By contrast, the auditors were able to track the infant formulation of artemisinin combination therapy down to the health facility level. 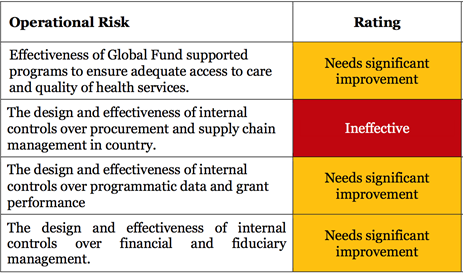 In the figure above, the pie chart shows Global Fund drugs traceability along the supply chain. 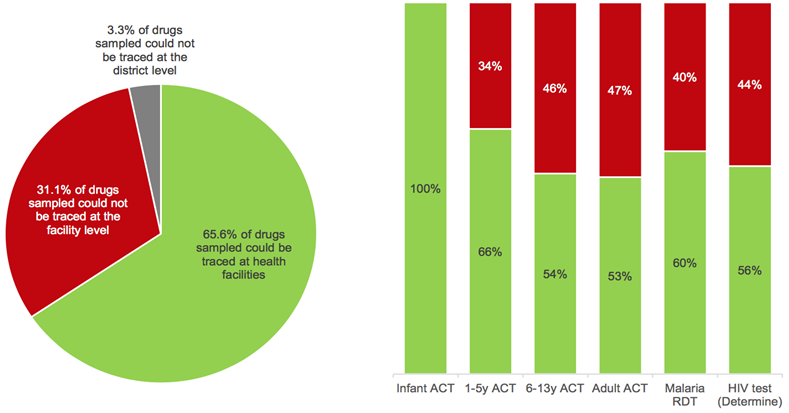 The bar graph shows the traceability of drugs dispatched from health zones, with the figures in red showing the percentage of untraceable drug by type. To address the problems raised by the OIG, the Global Fund Secretariat will present an analysis to the Global Fund’s Supply Chain Task Force of on-going and planned actions and pilot initiatives to strengthen the DRC supply chain arrangements for HIV and malaria health products financed by the Fund. According to the OIG report, the analysis will describe expected results, timelines, and the geographical focus of the actions and will cover warehousing, distribution and the last mile delivery arrangements managed by SANRU and Cordaid. The work will include a risk assessment and mitigation response options of the current last mile distribution arrangements for ACT and ART commodities. The analysis will also present options for the Global Fund in collaboration with other partners to sponsor a transformative supply chain project for essential medicines under the leadership of the Government of DRC, in line with the new National Supply Chain Strategy. The report also highlights that the quality of data in reporting is lacking and that inaccurate data continues to be reported, leading to decisions made without optimal information. The audit uncovered serious weaknesses with regards to both quality of the data compared to source documents, and internal controls around data transmission from one level to another. The report noted limited mechanisms exist to ensure data quality including a lack of guidance from the implementers on data quality. The data quality process heavily relies on sub-recipient attendance of monthly and quarterly data validation meetings at the health zone and provincial levels, and sub-recipient reports to principal recipients. The report states that the local fund agent in DRC conducts data quality audits through spot-checks or on-site data verification but that they are not done on a regular basis, with no independent data quality audit having been undertaken since 2012, and no regular data verification done in 2015 across all the diseases. The report makes specific mention of the fact that the total antiretroviral treatment population reported to the Global Fund was 4% higher than that reported by the health facilities. The actions the Fund management has agreed to take include indicating that the Global Fund Secretariat work with the principal recipients to develop a monitoring and evaluation capacity strengthening plan for the three diseases with a focus on data collection, quality and analysis. This plan will include appropriate strengthening measures to improve data quality such as the roll-out of DHIS 2 and Tiernet systems. The design of financial controls for civil society implementers has improved since the last OIG review in 2013 and was found to be adequate in spite of marginal compliance lapses identified. In contrast, serious weaknesses were identified in management and internal control capacities at the program management unit, which handles a portfolio of US$76.61 million on behalf of the Ministry of Health. To mitigate the financial and fiduciary risk present in this challenging operating environment, the Global Fund put in place a fiduciary agent in 2012 with a view to building stronger financial management capacity. The report states, however, that the first agent was replaced in 2014 because of weak performance. Also, the report states that The Global Fund Secretariat will transmit to the Cellule d’Appui et de Gestion (CAG) within the Ministry of Health, a set of minimum performance requirements (financial and procurement) to be implemented in order for the CAG to continue to be considered as PR. Subsequently, the Global Fund Secretariat will complete an assessment of the (CAG) to determine progress against the set of minimum requirements communicated to the CAG. The assessment’s findings and recommendations will inform a plan of action. Although the audit report did not identify any potential amounts to be recovered due to ineligible or undocumented transactions, the report is clear in stating there is much room for improvement in the way initiatives are implemented in the DRC.